Oh, be still my beating heart. A whole hamper of Alpha-H skincare goodies sat there, waiting to be used. It’s pretty much my beauty dream, that, but it’s not me who’ll be digging in – it’s one of you! Yes, wonderful readers, an early Christmas gift for one extraordinarily lucky person; a consultation with the brand and then a hamper full of skincare worth £250, tailor-made to your needs! Unless you’re very new to A Model Recommends you’ll have heard me talk a lot about Alpha-H. Concentrated skincare that actually works – I mean properly works – and that’s not concerned with pretty packaging or smelling of flowers or hiring a big movie star to do the ad campaigns. I have to quickly amend that last point, actually, because they have recently prettified their packaging a whole lot! It’s smarter and sleeker but still understated and the customer isn’t being forced to pay through the nose for the image facelift. I’ve said it before: if you’re looking for skincare that works – that really goes the whole way and more, then Alpha-H should be next on your list of things to try. I’m currently testing out the new Rejuvenating Cream so I’ll let you know how I get on with that; I’ve been trialling it for two weeks and so far it’s pretty brilliant. Proper review to come, though, so look out for that over the Christmas period. It would make an excellent hangover cream, I’m just trying to decide whether or not it’s better than the Liquid Gold Mask! If you want to read previous reviews, then start with my ones on Liquid Gold and the Liquid Gold Night Repair Serum. 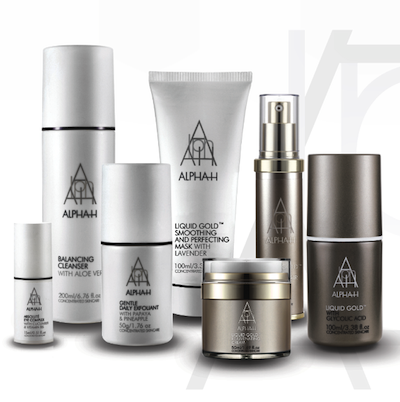 If you want to browse the products then Cult Beauty are offering free worldwide delivery for A Model Recommends readers on any Alpha-H product – just click here and use the code CULTAH. 2) Tell me your favourite Christmas movie. Mine’s Home Alone, yours can be anything you want it to be. Keep it clean. 3) All entries must be in by 12 noon on Wednesday 19th December 2012 and a winner will be picked at random that day. Make sure you’ve left me a way to contact you – if you’re signed in with the Disqus system your email or Facebook name or whatever should already be available to me. OK, good luck and off you go! Previous Post Monthly Favourites – With My Mum! Next Post Oh Dear: Green Tea and the ASOS Sale.